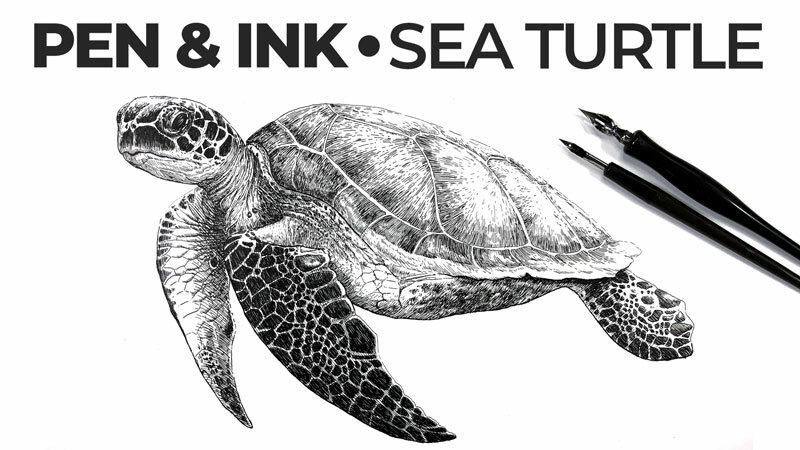 Pen and Ink - "Sea Turtle"
Watch, learn, and draw along in this 6 part lesson series where we develop a drawing of a sea turtle from start to finish. 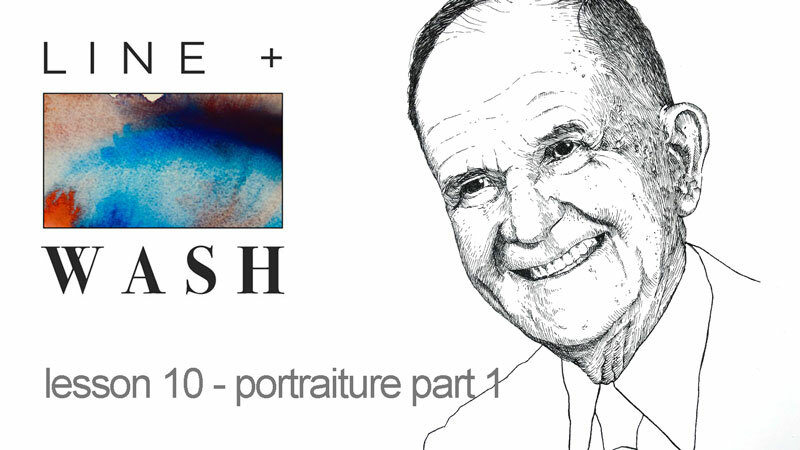 Part 1 of a series on creating a portrait with line and wash. In part 1, we develop the pen and ink drawing. Learn the basics of pen and ink drawing techniques. Pen and ink techniques, factors that affect the mark, and creating textures. Learn basic pen and ink techniques and create textures using various applications in this recorded Live Lesson. An introduction to "The Pen and Ink Experience" video course. How to use line to create the illusion of form and light in a drawing and a look at the most commonly used methods for adding shading to a pen and ink drawing. look at creating the illusion of simulated textures using a variety of mark making techniques. Learn how to use variety in line to create the illusion of form and light through line quality. Learn how to apply the concept of cross contour lines to shading using hatching and cross hatching. Learn ink wash techniques in this lesson. Improve your control over drawing lines. Supplies for every pen and ink artist. Learn how to use line to its full potential. Various techniques for fixing those mistakes made with ink. Learn how to draw with hatching and cross hatching. Basic drawing techniques including blending, hatching and cross hatching, rendering, and more. A step by step breakdown of drawing any subject with pen and ink. Learn how to draw a portrait with pen and ink. Combine watercolor and pen and ink to create an expressive mixed media portrait. Learn how to draw with professional markers in this lesson that features a drawing of a colorful skull. A look at portrait drawing with pen and ink. Cross contour lines play a vital role in communicating the value range and the form of the subject. Learn how to transfer an image to create an accurate ink wash in this recorded Live Lesson. Combine pen and ink with watercolor applications to develop a landscape that features a lighthouse. Learn how to combine pen and ink line applications with watercolor washes to create a landscape sketch. A four part lesson series on combining pen and ink applications with watercolor washes. A complete guide for drawing trees. Learn how to draw with alcohol-based markers and pen and ink in this lesson series. Enhance your creativity with this ink wash exercise. A look at combining textures and values to create a landscape drawing with pen and ink. Create an partially imagined landscape using diluted washes of ink in this four-part live lesson series. Learn the basics of drawing with pen and ink and ink wash. Learn how to draw a mushroom in this step by step lesson. 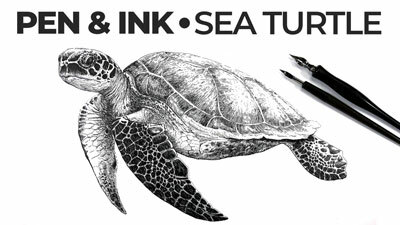 Learn how to use pen and ink to create the illusion of realistic textures in a pen and ink drawing. Learn how to layer pen and ink over watercolor in this two part video series. Combine ink, watercolor, gouache, and colored pencils to create a mixed media painting of sailboats. Draw a falcon with pen and ink in this step by step tutorial. 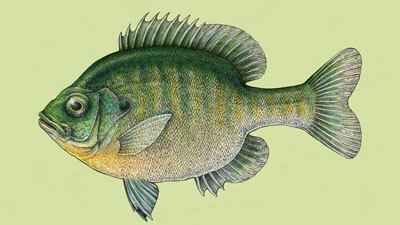 Learn how to add color to a pen and ink drawing with Photoshop. Learn how to draw a colorful dragonfly with pen and ink stippling in this step by step lesson and tutorial. Learn how to draw a lizard with pen and ink in this lesson and step by step tutorial that shows you how to create a variety of textures through hatching and cross hatching with ink liners. Learn how to draw natural textures with pen and ink liners in this in-depth step by step drawing tutorial that features a woodland creature in a magical forest. A five part lesson series on drawing a horse with pen and ink. Combine a variety of black and white drawing media to create a realistic drawing of a Great White shark. Learn how to combine pen and ink applications with watercolor washes to create a line and wash drawing of an octopus. Learn how to draw a bee with pen and ink in this lesson. Learn how to use scratchboard (scrapeboard) to create a representational image of a cat. A look at mixing application techniques (ink wash and pen) to create a looser, more expressive image. A two part series on drawing an eagle with pen and ink. Part 1 of a series on creating a still life with line and wash. In part 1, we develop the pen and ink drawing. Draw a Christmas wreath with pen and ink in this step by step tutorial. How to draw various leaves and nature-inspred goodness. Learn how to create a botanical drawing with pen and ink in this lesson series. A look at applying ink wash using multiple layered applications to build up value and the illusion of form. A two part series on combining watercolor and pen and ink. Recorded Live Lessons. Watch the process of creating an ink wash still life from start to finish in this full length video. Ink can be applied to a surface through a pen or by brush. Ink has been a reliable medium for many illustrators because of its permanence, versatility and its ability to be reproduced accurately. Inks come in a variety of colors and can be applied to a variety of surfaces. Mostly inks are applied to smooth surfaced papers, but watercolor paper is also an acceptable surface. Inks can be applied to dried watercolor paintings and are often used in conjunction other mediums.